As a parent, nothing is more important than the health and safety of your children. If your dentist has recently recommended a fluoride treatment for your child, it is only natural to be concerned about the safety of fluoride. 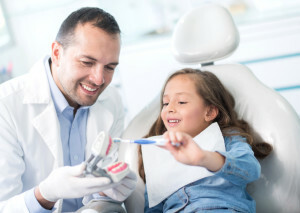 As a children’s dentist in Williamsville, NY, we understand your concerns. We often recommend fluoride treatments to help prevent cavities. Fluoride is safe and effective for reducing the development of tooth decay in children by as much as 40%. With tooth decay one of the most common childhood disease, these treatments are essential to protecting the health and development of your child’s teeth. Fluoride remains one of the best and safest ways to prevent cavities in both adults and children. Often referred to as “nature’s cavity fighter,” fluoride works to make the enamel stronger and more resistant to the acids in the mouth that are responsible for causing tooth decay. It is not only effective for preventing tooth decay, but is shown to also reverse the signs of early decay. Does My Child Really Need a Fluoride Treatment? Fluoride is found in some levels in all natural water sources. In addition, many public water sources add just the right amount of fluoride to tap water using strict guidelines set in place by the EPA. Not to mention, there are many fluoride toothpastes and over-the-counter dental products that also contain fluoride. With the wide availability and access to fluoride, you may be wondering, “does my child need a fluoride treatment from a dentist near me?” The answer is, yes. A fluoride treatment from the dentist is a sure way to guarantee your child is receiving the right amount of fluoride to protect their teeth. Naturally, you are probably concerned about dental fluorosis, which happens when a child receives too much fluoride. This usually occurs before the age of eight. As the child ages, small white spots can develop on the teeth. However, these spots are purely cosmetic and the occurrence of dental fluorosis is low. In fact, less than 2% of people have any noticeable signs of receiving too much fluoride. The treatment is quick, painless, and performed at semi-annual dental appointments. After cleaning your child’s teeth and performing a routine examination, we paint a thin layer of fluoride varnish to the teeth. Although the varnish tends to be a bit sticky and yellow, it has a somewhat pleasant taste so most children do not mind it. The varnish will sit on the teeth and set quickly. However, it is best to not let your child eat or drink for 30 minutes after the treatment. To safeguard the health of your child’s teeth, fluoride treatments are an excellent decision. With the treatments, you will help stop the development of cavities. In addition to fluoride, we offer additional preventive treatments, such as dental sealants, to ensure your child’s teeth stay strong and healthy. If you are ready to protect your child’s teeth with fluoride, please contact our office to schedule a consultation.